Hi, I’m Ben, the founder of Yuba. I grew up on two wheels in Strasbourg, France. 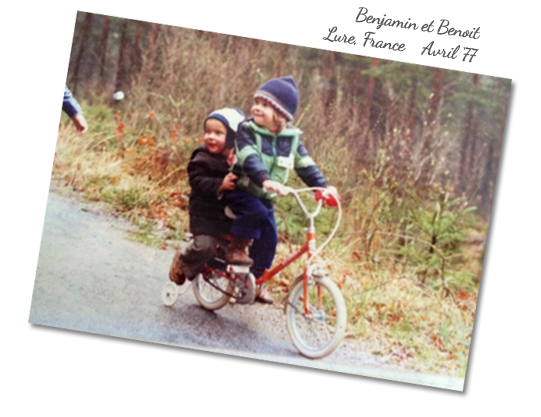 Here’s a photo of me and my cousin Benoit riding our first cargo bike. Since that first ride, I’ve been in love with bikes and what they can do. Over the years, I’ve had a lot of adventures. I traveled in East Africa where I saw merchants transporting their goods on two wheels. I spent time in Latin America where dirt roads and broken trucks made bikes the best way to get around. Sometimes what I saw while traveling upset me: waste, environmental damage, or social inequality. For a lot of small businesses or for families living in remote areas, I saw that bikes could enable people and make their lives better. Eventually I grew up(ish) and translated my passion for bikes and observations of the world into Yuba Bicycles, named after the California river where I love to kayak and connect with the natural world. My wife Emily and I started a family, and we couldn’t wait to pack the diaper bag and toddler along on our adventures. My family and I love to ride bikes. We also love to make bikes, and for us they are tools AND toys. If I try to put my sleepy, cranky toddler son in a car seat after a long day, the poor little guy howls. But when I put him on the back of a Yuba, he grins every time. We love being outdoors, living a healthy lifestyle, and waving at the neighbors as we pass. 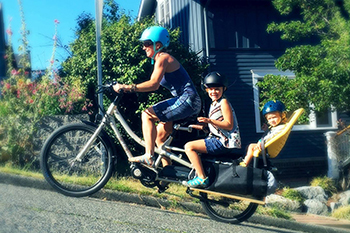 The best part of being the founder of Yuba is the moment when I see a family ride a new bike home from the bike shop, on their way to new adventures. When moms tell me they feel safe picking their child up from school and stopping on the way home for groceries, smiling the whole way…that’s when I know I’ve done my job well. Because I know as well as anyone that even us parents love to have fun, be outside, and share new experiences and adventures. I say, let’s bring the kids along! When Benjamin is not hard at work working promoting Yuba. He can be seen training and racing on his Stand Up Paddleboard, Ben is one of the top Whitewater paddleboarder in the country. He also won the Tahoe Cup in 2013. Ben likes riding with his kids around Sonoma and Marin counties. Another long-timer in the Yuba world, Marc spends his days making sure everything runs smoothly at our HQ in California. His favorite part of his time here are the hundreds of people he’s met from all facets of the bicycle world, from casual riders to those who have spent their lives promoting and advocating cycling. A Sonoma County native, Marc loves introducing his daughter and son to the sights and activities nearby on their Mundo! 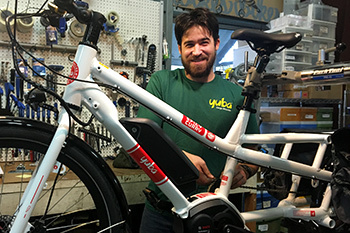 Mr. Tim, Timmy, Timo, Rico– whatever you want to call him– has been on the Yuba team since 2013. 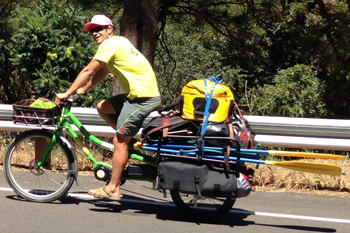 He’s helped move Yuba’s product line from 2 cargo bikes to 5+ cargo bikes. A little known fact about Tim is that he lives in Asia and visits the Yuba HQ for 9 months out of the year. You’ll often find Tim shredding nearby trails or bike partying on his Yuba in the city. Kate comes from all corners of the bicycling world. She strongly believes bicycles are an important tool for social change and is committed to promoting a healthy lifestyle through everyday biking. Kate is a total safety nerd; a big fan of reflective stickers, helmets and hand signals. She can often be found rolling through the streets of Oakland with her dog, Sonny, strapped to her back. Emily comes from the design world with almost two decades of experience in all things print, package, event, and web related. She was happy to trade in hi-tech clients for pedal powered projects and can often be seen hauling her two little ones around on the back of a Spicy Curry. Jeff is a long-time industry vet with a supreme passion for riding bikes, any and all kind of bikes. He chooses to live car-free in the very urban neighborhood called “The Northside” in his beloved hometown of Pittsburgh, PA. So it makes good sense that the bike he rides the most is his fully loaded Spicy Curry Cargo Bike. 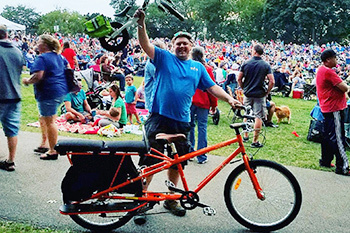 Tony Landucci joined the Yuba Cargo Bike family in 2014 when he bought his first Yuba Mundo LUX. Three long years later he left his career as a local news reporter for print and radio to reinvent himself… and get some exercise. 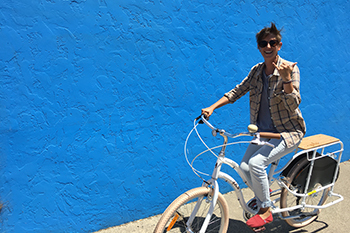 Tony’s favorite things to do include traveling around the US to talk about the advantages of the cargo bike lifestyle. His least favorite thing to do is sit in traffic when he could be riding one of his bikes. Denise comes from the organic food industry where she developed a passion for living a healthier lifestyle. She is very excited to have joined the Yuba team and is looking forward to the positive lifestyle change peddling will provide her and her family. She’s likely to be seen riding around Sonoma County with her youngest of three riding along with her. Kenny (or Ken) has been working as a bike mechanic for over 10 years and loves everything bikes. He has worked on almost every style of bike imaginable, including trikes, recumbents, and even a penny-farthing. Ken can usually be found in the Yuba warehouse running around with tape guns and listening to prog rock. Another Sonoma County native, Ken knows how to get almost anywhere in the county without looking at a map. He is also the fastest Yuba employee on pedal power, clocking 57 mph down Rock Pile Road near Lake Sonoma. 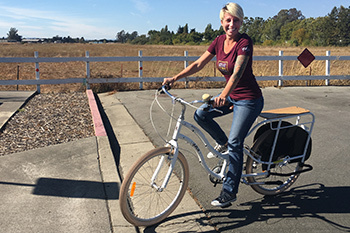 Kristi is the newest addition to the Yuba team. She is excited to be working in her native home county of Sonoma and helping Yuba fans from all over the country. In her free time, Kristi loves exploring the town with a late night bike ride. More than anything, she is looking forward to trading in her car for a Boda Boda on her way to Yuba!